The map shows the campsites that we've used in Botswana over the past few years. The prices are for dates that we stayed there. Below the map is information about them, listed in alphabetical order. You can click on the places on the map or scroll down the page. 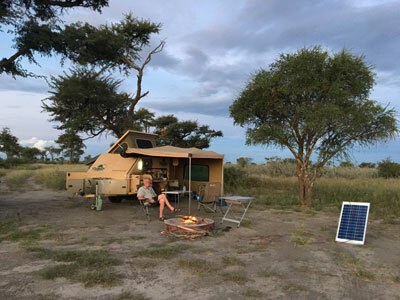 Booking campsites in the Central Kalahari is a pain as they are now run by 2 organizations, either by Big Foot Tours or by the Botswana Department of Wildlife & National Parks (DWNP). You usually have to book and pay in advance - if you just turn up at the entrance gate you're likely to be turned away. You also have to pay the Park fees to the DWNP once you've booked campsites in the Park. I understand that they now accept payment for the Park Fees at the Park Entrance Gates but this is unconfirmed so check with DWNP. Big Foot only have offices in Gabarone so it's best to contact them by phone. We were able to book 3 nights at Sunday Pan and then pay in cash at the gate. The sites are similar to the ones run by the DWNP but much more expensive! 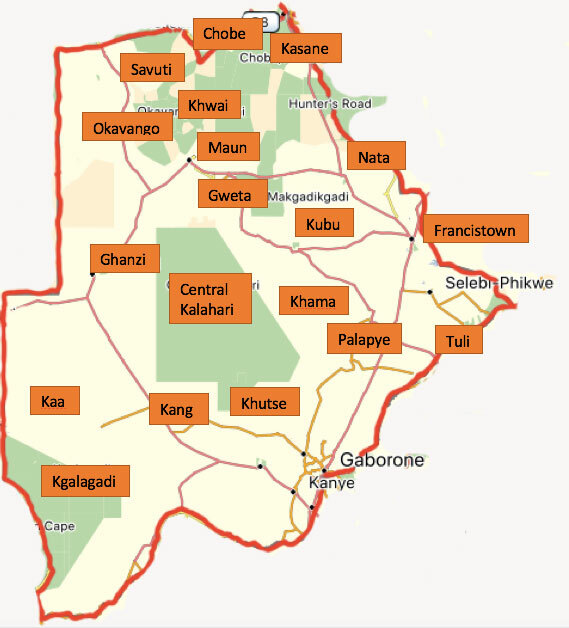 The DWNP have offices in Gabarone and Maun so, again, contact by phone is best. If you camp at the Big Foot sites you'll need an invoice to show to DWNP in order to pay for the Park fees. Central Kalahari. Sunday Pan site 3. Feb 2012. Cost: Campsite: P60 per night for 2 people. Entrance fee P120 per person per day plus P50 per vehicle per day. Ablutions: Pit latrine and bucket shower (you need to provide your own water). Sites: Good shade. The sites are spread out and only site 2 is within walking distance. Other: Less than 1km to the Sunday Pan waterhole. back to map at top of page. Central Kalahari. Kori 2 Camp. Feb 2012. Contact: Department of Wildlife & National Parks. Sites: Good shade.The sites are spread out and are next to Deception Valley. Other: Other: The Kori & Deception campsites are popular as they're so much cheaper than the ones run by Big Foot. We prefer the Kori sites as they're closer to Deception Valley. Location: S17° 50' 21.2" E24° 52' 43.0"
Cost: Expensive. I think it was US$ 40 per person per day to camp for internationals, plus the daily park fees. Ablutions: There are 2 ablution blocks. The one we used was OK with hot showers but rather run down. Sites: There are 10 sites alongside the river channel which might have water depending on the time of year. We stayed at site 9 which had a large shady tree and a good view of the river which, in March, was right next to the campsite. A guy came round in a bakkie offering wood which you could order. Other: As we went towards the end of the wet season we expected the animals to be all over the park, however they were mostly close to the river. 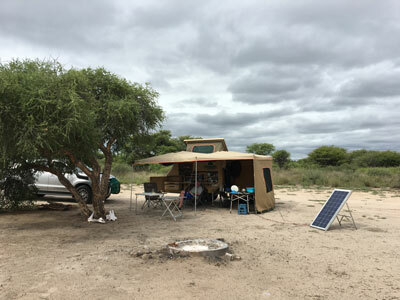 We saw elephants every day from our campsite and, one day, they passed in front and behind our site so driving to the ablutios is sometimes the best option.Ihaha is a very popular campsite and during the dry season you are likely to have to book well in advance. In March we were able to book in at the gate but they only accept cash in Pula or US$. Location: About 20km from Francistown on the Nata road. Cost: P105 pppn. plus P30 for a trailer. Electric: Yes at an extra cost. Sites: The grassy pitches are quite small but fine for a night. All have a braai and electric point and some also have a fire base and a drinking water tap. Other: This is an ideal stopover near Francistown. There's a beautiful, clean swimming pool. Ghanzi. 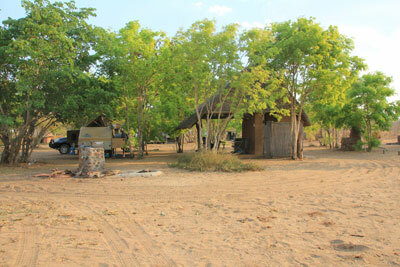 Thakadu Bush Camp. March 2012. Cost: 60 per person per night. Ablutions: Clean. Hot water & showers. 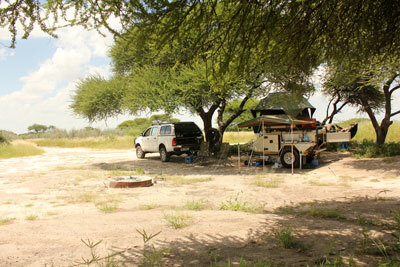 Sites: Large shady pitches each with power, drinking water, braai and a bin. Other: There's a bar, restaurant and pool. Good wireless internet access - P40 for 2 hours, which can be used over several days. Cost: P68 pppn. Credit cards accepted. 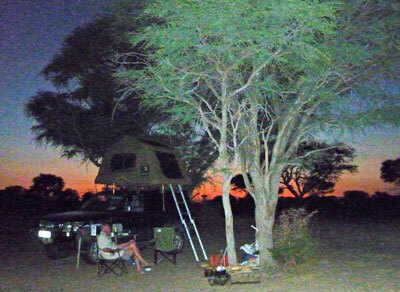 Sites: There are 6 sites for independent travellers which are separate to the sites for overland trucks. Each site has a shaded area, braai, fire base and electric point. Other: There's a pool, bar and restaurant. Wi-fi internet access is P30 for 30 minutes. When we arrived at reception we were handed a cold flannel and an iced tea, both most welcome after our dusty trip from Kubu Island! They offer various trips to the pans, from half a day to overnight options. Cost: You need to pay (can't remember how much) at either Ngwatle or Ukhwi villages. At Ukhwi there were people on the track through the village who we paid and got a receipt. At Ngwatle(on our 2nd visit) we tried to find the chief's hut (no-one had any English) and when we eventually found it they couldn't find the receipt book so we weren't charged. Site: Just one site overlooking a large pan. Other: If you like being on your own (we saw no other vehicles for the 3 days we were there) and you don't mind roughing it then you'll love this spot. It overlooks the Pan and although you're unlikely to see predators you'll see antelope and plenty of birds. Kang. Kang Ultra Stop. March 2012. Cost: P40 per person per night. Ablutions: Clean, Hot water & showers. Sites: The campsite was closed for rebuilding (March 2012) but we were able to stay on the gravel in the wooden chalets area. Other: There's a pool, bar and restaurant. A useful overnight stopover. Kasane. 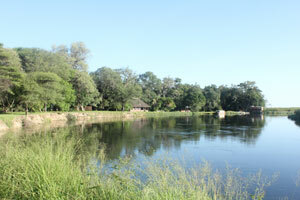 Chobe River Lodge. Nov 2011. Sites: There are lots of small marked pitches under shady trees. Other: There's likely to be a few large overlander's trucks but we've never found it too noisy. There's a walkway to the Lodge where there's a pool, bar and restaurant. The sunset cruises from the Lodge are excellent. Ablutions: Your own personal shower, toilet and kitchen area. Hot water from a donkey boiler. 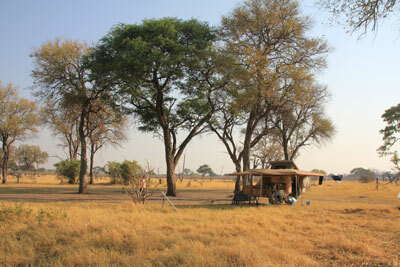 Sites: This is a lovely quiet, shady site not far from Kasane. You'll be made very welcome by the owners, Louw and Lulu. 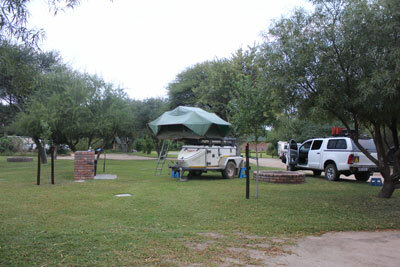 All sites have a shade structure, private ablutions, a braai and fire base. A guy will light the donkey boiler for you in the morning and again in the afternoon. There are no fences around the site so you may get animals browing nearby. 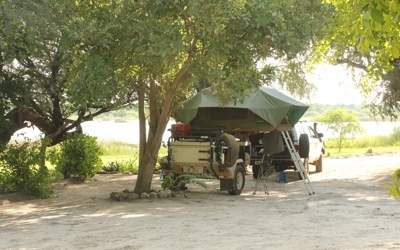 Other: If you like the bush then this is undoubtedly the best campsite in the Kasane area. The site is in the Lesoma Valley and the waterhole with a fresh water outlet is a favourite with elephants but you're likely to see other animals as well. We saw roan antelope, sable, giraffe, impala, kudu and warthog. There's a great view of the waterhole from the raised bar area and a different perspective from the underground bunker. There's a fenced swimming pool.You can buy firewood at reception.Free wifi from 5pm to 9pm round the deck area. Day trips to Vic Falls, Sunset cruises and game drives can be organised at reception. Half price from the middle of January to the middle of March. Chalets are also available. The campsites are run by Bigfoot Tours. I found it easiest to ring them and they then gave me an email address as the one on thier website didn't work. You also need to pay the Park fees to the Department of Wildlife and National PArks. It's a relatively small Reserve but it borders thesouthern part Central Khalahari. It was very quiet when we were there. Firewood (large pieces) can be bought at the gate. There are no fences around the campsites. You have to take all your own water and it's best to take your own 12volt shower as several of the campsite showers were broken. Khutse. Moreswe Site 2. February 2018. Location: S23° 33' 43.1" E24° 05' 48.7"
Ablutions: Pit latrine. Bucket shower but the shower rose and tap had broken. Other: You can drive around the Pan and along a track and around another nearby Pan. Location: S23° 23' 03.4" E24° 11' 12.7"
Ablutions: Pit latrine. Bucket shower - there was no rose but the tap did work. Sites: The closest site to the Watehole but no view. There was some shade. Other: Nowhere to drive except along the main track and the short tracks around the waterhole. There's no Pan so you can't see very far. Probably a good site in the dry season when animals are dependent on the waterhole. A bit of shade. Long drop toilet- and a shower that worked. 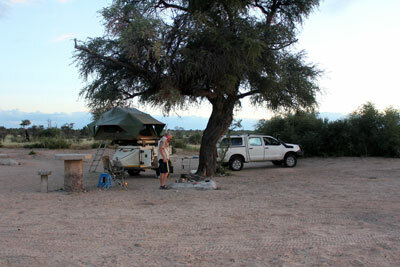 The nearest sites to the entrance, there are 10 campsites but in February we were the only people there. 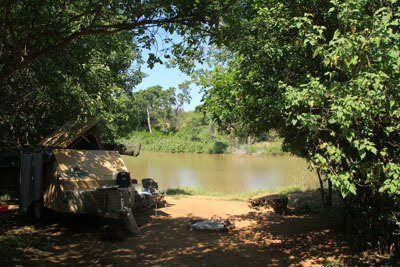 None have any view but it's a short drive to the huge Pan which has a waterhole. This section seemed to have the best grass when we were there and by far the most animals. Location: S23° 20' 20.8" E24° 30' 05.7"
Ablutions: Pit latrine - and a shower that worked. Sites: A small site with a bit of shade. 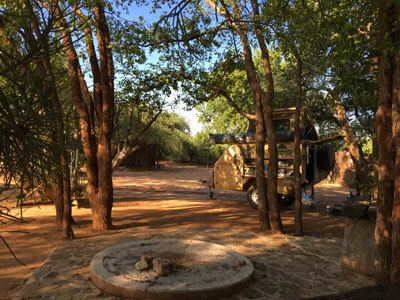 Other: There are 10 Khutse campsites which are the ones closest to the Entrance Gate but in February we were the only people there.. None have any view but it's a short drive to the huge Pan which has a waterhole. This section seemed to have the best grass when we were there and by far the most animals. Kgalagadi Transfrontier Park (KTP) Mabuasehube area. The Department of Wildlife & National Parks still run all the camps in this Park so booking is much easier than other Botswana Parks. KTP. Mpaathutlwa Camp 1. March 2012. Location: Mabuasehube, Kgalagadi Transfrontier Park. Cost: Campsite: P30 per person per night. Entrance fee P20 per person per day plus P4 per vehicle per day. Ablutions: Pit latrine. Shower (cold water). Site: A lovely location with excellent shade overlooking the Pan. You can just see the waterhole from the edge of the site. Other: This is one of the most popular sites in this part of the Park as it overlooks a pan with a permanent waterhole which is popular with game. We've always heard (but not always seen!) lion in this area. KTP. Lesholoago Camp 1. March 2012. 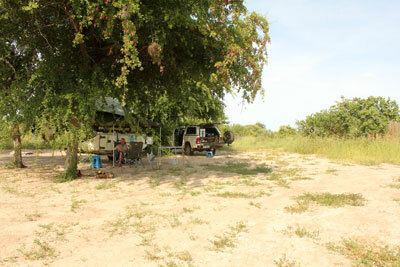 Sites: A lovely location with some shade overlooking the Pan. You can just see the waterhole from the edge of the site. Khama Rhino Sanctuary. April 2016. Location: 5km NW of Serowe. Cost: Campsite: P102.85 pppn. Park fees: P78.65 pppd plus P284.35 per vehicle per day. Credit cards accepted. Ablutions: There are 2 ablution blocks. Clean. Hot water from an electric geyser. Electric:Not at the sites. There's a plug point in the ablutions. 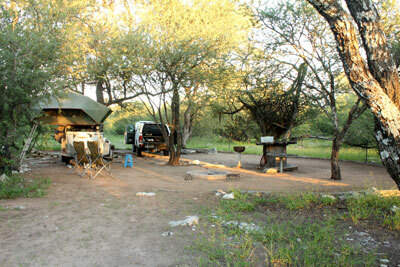 Sites: There are 13 large unfenced campsites spread out in the bush a few kilometres from the entrance gate. 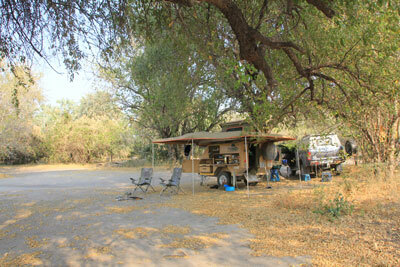 Each site has a braai, fire base, cold water tap, bin and shade from large Mokongwa trees. Other: The Reserve was set up as a safe breeding location for white rhino. There are self-drive tracks around the reserve, you can buy a map, P10, from the shop at the entrance which also sells wood, curios, cold drinks and snacks. The tracks in the Park are sandy. We didn't lower the tyre pressures and managed fine in high 4 wheel drive. Ablutions: Each site has a rather smelly longdrop toilet. Sites: Large sites on the northern and western side of the island. Some have shade. Other: There's no water so take all you need. 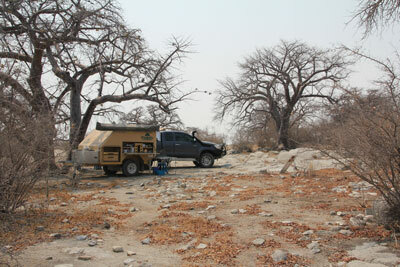 You need a 4x4 to get to Kubu Island and it's only accessible during the dry season. It's 45 km of stony / sandy / dusty tracks from the south and 100km of lots of dust from Gweta or Nata! That said it's pretty amazing driving across the Pansand having a look around the island which has large rocks and huge baobab trees in the middle of a huge pan. Khwai Development Trust. Magotha Campsite. September 2013. Sites: There are 15 sites of which numbers 1,2,3,4 and 15 overlook the Khwai River. We stayed at site 1. Other: You must book before you go. 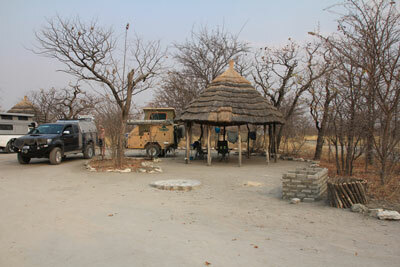 If you travel via Moremi / Khwai North gate then call in at the village to show your reservation. If coming from the Savuti direction then camp wherever you want and show your reservation when the village guys come around. If you want to visit Moremi them you'll need to have paid for day permits in advance. You'll need a 4x4 with low range to get around the area. 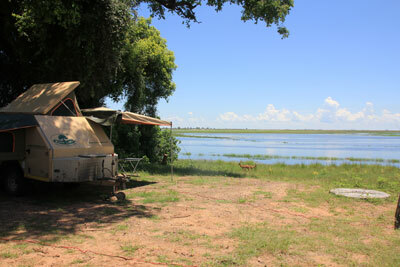 There are several river crossings, best to watch or ask other campers before crossing as there are some deep holes - and crocs and hippos in the river. We saw lots of game in the vicinity of the river during the dry season. Location: 35km East of Maun. S20 10.280 E23 40.398. Cost: P100 per person per night. Electric: Provided by a generator from 6 - 10pm. You'll need a long cable. Sites: Lovely grassy sites next to the Boteli River. Other: There's a bar & pool. Used by Drifters Tours a couple of nights each week. Maun. Sedia Hotel campsite. September 2013. Cost: P50 pppn. Credit cards accepted. Ablutions: One ablutions block for the site. Clean. Hot water & showers. Electric: There are several power points around the site. Sites: No marked sites, just pitch wherever you want. There are plenty of bushes and a few large trees for shade. 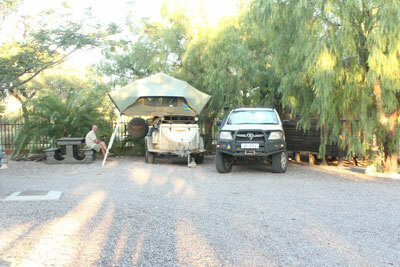 The overland trucks tend to use the open area between the ablutions and the hotel. Other: There's a bar, restaurant and a large pool. 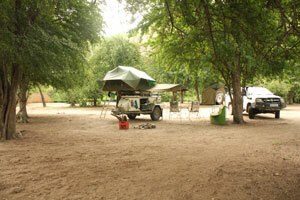 There are likely to be a few 'Overland' groups but this is the quietest place that we've stopped at in Maun. There's free wi-fi interent access in the reception and bar area, plus an internet cafe. Nata. Elephant Sands. March 2018. Location: About 50km north of Nata. 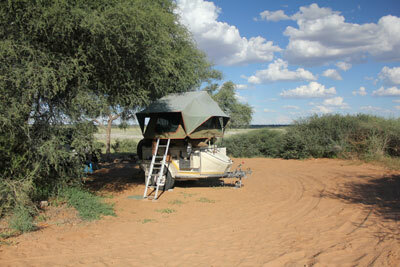 S19° 44' 56.7" E26° 04' 16.2"
Contact: Elephant Sands Bush Lodge & Campsite. Ablutions: 1 ablutions block which was clean with hot water. Sites: An open site (no shade at all) with a few sites overlooking the waterhole which is frequented by elephants, although we didn't see any in March. No fences around the site. Other: There's a bar, restaurant and pool. There are now lots of chalets almost all the way around the waterhole. 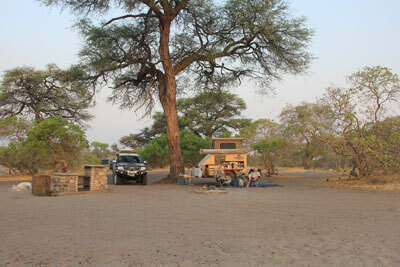 The campsite is very popular with overland groups - apart from during the rainy season when it's almost empty. Nata. Pelican Lodge. March 2018. Location: Just south of Nata. S20° 13' 04.6" E26° 14' 01.4"
Cost: P100 pppn. Cards accepted. Ablutions: Each site has its own ablutions with plenty of hot water. 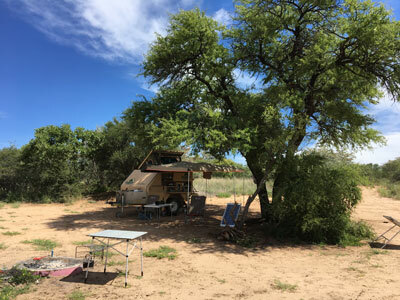 Sites: There are 3 sites at the back of the Lodge. One has good shade. The water is OK for drinking. Other: You can buy firewood - a guy will bring it to your site. There's a bar, restaurant and a large clean pool. Free wifi in the pool and bar area. Chalets are available. Okavango Panhandle. Shakawe Fishing Lodge. Feb 2012. 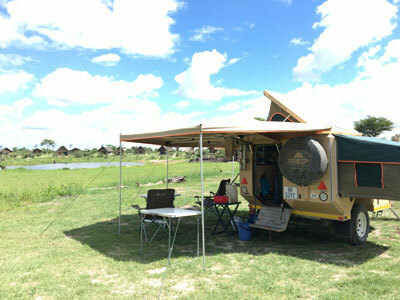 Sites: Great sites beside the Okavango River. Other: The campsite (and chalets) are currently being refurbished - new owners took over in 2011. If you like birding then ask to be taken round the nearby woodland where there are pel's fishing owls. Okavango Panhandle. Tsodilo Hills. Feb 2012. Cost: camping is free but you have to pay to see the rock art sites. Ablutions: Hot water and showers. Electric: Yes from the main building but you'll need a long cable. Other: We camped in the area close to the museum. There are a couple of other places to camp but they have no facilities.If you want to see the rock art (the main reason for coming here after all) then you'll need to book a guide at reception. Location: S22° 33' 34.6" E27° 07' 39.4"
Ablutions: They were clean but the electric showers were either cold or too hot! Electric: There were a ffew electric points (not all working) dotted around. Sites: Several sites (not marked) most with some shade. Some had fire pits and/or braai facilities. Other: There's a bar, restaurant and pool but when we were there the pool looked at bit dirty. Some taps provide drinking water. Chalets also available. Savuti Camp, Chobe National Park. Sept 2013. Cost: Campsite: $US 50 pppn (international visitors). Entrance fee P120 per person per day plus P50 per vehicle per day. Ablutions: One central ablutions block protected from the elephants by a big earth wall. Clean. Hot water. 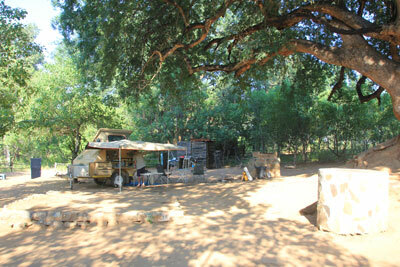 Sites: Most sites have a braai and fire base and are situated under shady trees. We like sites 1, 2, 3 and 4 best as they overlook the Savuti Channel which, in Sept 2013, still had plenty of water in it. There are no fences around the camp so you will see animals wandering through the site. Other: Currently the only place where you can cross the Channel is by the bridge next to the Rest Camp. During the dry season none of the waterholes away from the Channel had any water in them so the best animal viewing is within a km or so of the Channel. Several loop roads marked on the map aren't passable because of the mud/water. Tuli Block 1. Limpopo RIver Lodge. April 2016. Cost: P122.00 / R183.00 per person per night. Ablutions: Shower, flushing toilet and sink with hot water from a donkey boiler or solar water heater. Toilet paper not provided. Sites: Good sized sites. All have good shade and are on the banks of the Limpopo. Each site has a braai, ground fireplace, cold water tap (not drinking water) and, behind the site, private ablutions. Firewood is provided. Other: We saw plenty of birds at the site and it was lovely sitting by the river. We only had a couple of nights there and would certainly spend longer there on another trip. You can drive around the Reserve. Tuli Black 2. 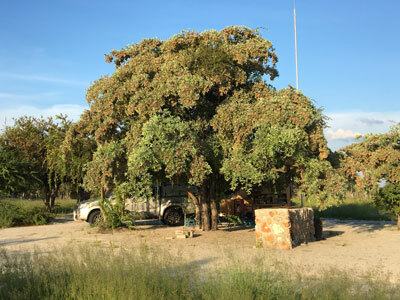 Molema Bush Camp. April 2016. Cost: R300 per person per night. Sites: 4 large sites under huge shady trees. Each site has a braai, ground fireplace, shower, toilet, sink and water tap (not drinking water). Site 1 is on sloping ground with a level raised area for tents. 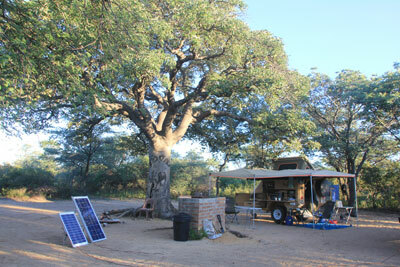 We were on site 2 which did have some level ground but we did have to keep moving our solar panels because of the shade from trees. Other: There are no fences around the camp so you might get animals in camp. Baboons and vervet monkeys are around and will steal any food left out. You cannot self drive in the Reserve. Morning and afternoon drives (R300 pp) and bush walks (R275pp) are available. We did a bush walk and morning and afternoon drives and found the guide informative. It a short walk through quite thick bush to the Limpopo RIver.